JFK Memorial Medal awarded to Major General Patrick Brady. The Ancient Order of Hibernians and the Ladies Ancient Order of Hibernians, awarded their highest honor, the John Fitzgerald Kennedy Memorial Medal, to Major General Patrick Brady. While in Vietnam General Brady was awarded the Medal of Honor for a series of rescues, which began at sunrise and ended after dark. Repeatedly competent advisors warned him that the missions were impossible due to weather, the enemy situation, and mines. On three different missions and six tasks, Major Brady extracted patients from areas where other aircraft failed. On two different occasions his aircraft was hit by automatic weapons fire. On a third occasion his aircraft was severely damaged by a mine. Major Brady’s aircraft were so severely damaged that three aircraft were required to complete the missions and at the days end the aircraft he flew had over 400 bullet holes in them. In the process two crew members were injured. During the day Major Brady evacuated over 70 patients many who would have died without expeditious medical care. In two tours in Vietnam he flew over 2,500 combat missions and rescued over 5,000 wounded. He developed foul weather and tactical techniques for air ambulance rescue never before executed in combat for which he is identified in the Encyclopedia of the Vietnam War and other books as the top helicopter pilot in that war. Some pundits recognize him as the most decorated living veteran. 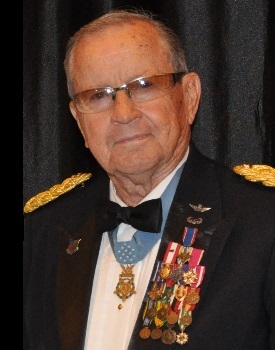 General Brady is the only living Army veteran of Vietnam to hold both the Medal of Honor and the Distinguished Service Cross, our nation’s second highest award. His other awards include two Distinguished Service Medals; the Defense Superior Service Medal; the Legion of Merit; six Distinguished flying Crosses; two Bronze Stars, one for valor; the Purple Heart, the Vietnamese Cross of Gallantry with palm and Silver Star and 53 Air Medals, one for valor. He is a member of both the Army Aviation and Dust Off Halls of Fame, he is the first and only Army Aviator in the National Aviation Hall of Fame. He is also the only Army Aviator to receive the Bob Hoover Freedom of Flight Award. General Brady is the former President of the Congressional Medal of Honor Society. He has a bachelor’s degree in psychology from Seattle University and an MBA from Notre Dame University. General Brady and his wife Nancy were blessed with six children. General Brady is a Catholic of Irish descent who is truly outstanding in his field of endeavor.